Gold The story of Indian jewellery goes back over 5000 years to the prehistoric past. Different regions of India have jewellery-making styles unique to them. In India ornaments are made for practically every part of the body. As part of its aim to empower Women through charity activities, Chemmanur International Group is launching a chain of 2,900 Boby Bazaars across India, with the aim of providing employment opportunities to three lakh women. Worlds Successful, Chemmanur International Jewellers , coming with GO GREEN , ECO FRIENDLY & Largest township in kerela , sprawling across 62 Acers “ CHEMMANUR OXYGEN CITY “ @ Mannuthy, Thrissur, Kerala. With all state of the art facilities like Flat, Villa, Amusement Park, Shopping Mall, Multiplex, 5 Star Hotel, Bank International School, Sports ,Holistic & Convention Center, Food Court & Helipad at a location which is easily accessible, you'll have an abode surrounded with the harmony, ambiance and greenery of nature and without the usual hustle and bustle of the city life. 3. Food ball Legend & GOLD Partner DIEGO MARADONA Owns House No.10 @ our CHEMMANUR OXYGEN CITY, International Training Center to train Food Ball Players. 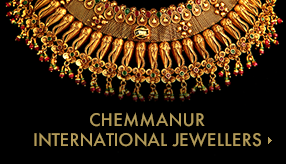 Chemmannur International has a rich, multi-splendered legacy. Having started way back in 1863 as a small shop at Varanthirappilly, Trichur, it cruised along to become a world renowned brand appealing to a trans-national crowd of 19 crore people under the visionary leadership of charismatic, inimitable Boby Devassikutty Chemmannur, it's Chairman. Boby with his innate sense to gauge the mood of the public, their likes and desires mustered the the finest craftsmen from around the country to create the latest customer-oriented designs, gracing the imagination of the public. Apart from the jewellery and diamond the group is involved in diverse activities such as credit & investment, charity, real estate and Airlines. Through innovative business oppportunities involving the public with a handsome return for the investment, the organisation has acquired the trust of the people. 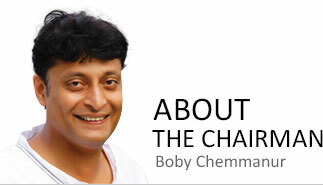 Boby Chemmanur comes across as a simple gentleman. Mostly seen clad in unique dress inspired by the traditional wear of Native Malayalis during the turn of the last century, he is simplicity personified. But he is also one of the most successful businesspersons in the country and also one of the more socially responsible ones.